The combination of blood tests and mobile applications can predict thoughts of or attempts at suicide with more than 90% accuracy, according to a study published Tuesday in the journal Molecular Psychiatry, the Washington Post‘s “To Your Health” reports (Eunjung Cha, “To Your Health,” Washington Post, 8/19). Level of uncertainty about things. During the study period, about 20% of the subjects went from no suicidal ideation to high levels of suicidal ideation. The researchers analyzed their blood samples to identify RNA biomarkers that correlated with suicidal thoughts (“To Your Health,” Washington Post, 8/19). According to the study, the blood test was able to predict suicidal ideation across psychiatric diagnoses with 72% accuracy. Specifically, for bipolar disorder the figure rose to 93% for suicidal ideation and predicted future hospitalizations with 70% accuracy. Meanwhile, the study found the mobile app for affective state predicted suicidal ideation across psychiatric diagnoses with 85% accuracy, while the suicidal risk factors app predicted such ideation with 89% accuracy. The researchers found that by integrating the blood test and the clinical information from the app, they were able to predict suicidal ideation across psychiatric diagnoses with 92% accuracy. The researchers wrote, “Both types of tests we developed (blood biomarkers and clinical information apps) do not require asking the individual assessed if they have thoughts of suicide, as individuals who are truly suicidal often do not share that information with clinicians” (Molecular Psychiatry, 8/18). 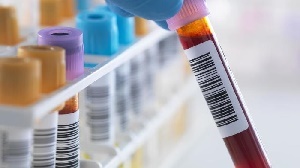 Because the study was limited to men diagnosed with psychiatric disorders, the researchers also noted that it’s unclear how well the blood tests would predict suicide ideation in a wider population. They noted that the app is ready for testing in real-world settings, such as emergency departments (“To Your Health,” Washington Post, 8/19).